EAW006098 ENGLAND (1947). Lindisfarne Castle, Holy Island, 1947. This image was marked by Aerofilms Ltd for photo editing. 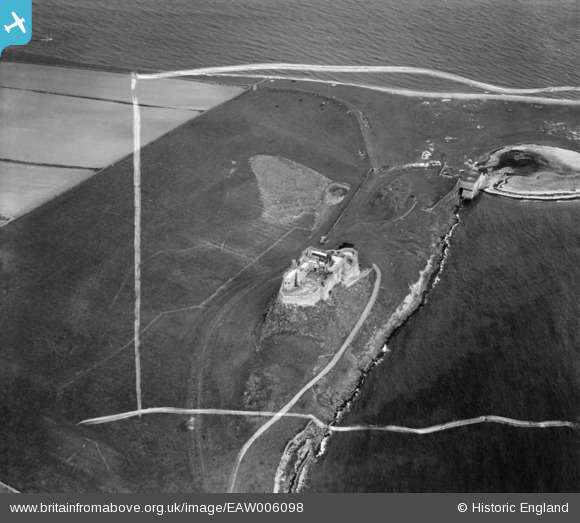 Title [EAW006098] Lindisfarne Castle, Holy Island, 1947. This image was marked by Aerofilms Ltd for photo editing. Edge of garden designed by Gertrude Jekyll. Originally a tramway by which limestone was brought down the eastern side of the island to limekilns immediately east of the castle. The kilns' quicklime output was exported (mainly to Scotland) during the 1870s and 1880s from jetties just west of the castle. In the 1850s and 1860s a similar system had operated on the western side of the island, exporting the quicklime via a jetty west of the village.